1. A brand new southbound bus shelter was installed on Belknap Campus on 4th Street just south of Cardinal Blvd. This shelter provides an out-of-the-elements place to wait for buses on Route 4 (with direct service from Belknap campus to south Louisville (Beechmont, Kenwood, Glengarry, and Louisville Industrial Center) on all-electric buses with bike racks for up to three bikes!). 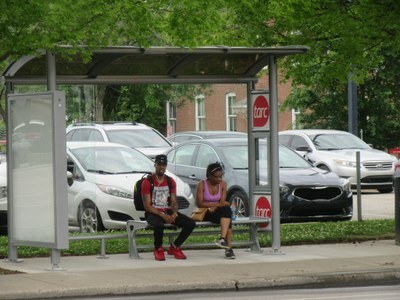 Two identical new TARC shelters will be installed further south on the east side of 4th Street at Brandeis Avenue and University Pointe to replace UofL's out-dated bus shelters. 2. All TARC buses will become free WiFi hot spots for internet access by June 1st. “TARC is putting WiFi in motion to make it more convenient to ride, and because internet access is a growing necessity for connecting people, and accessing opportunities and information,” said J. Barry Barker, executive director of TARC. TARC, with a fleet of 227 buses, already provides WiFi on 156 buses and work is underway to enable WiFi on the remaining 71 buses, Barker said. Barker was joined by Mayor Greg Fischer and Jake Sion, of Montreal, chief operating officer for a mobile app that tracks buses in real time, in announcing the upgrades at a news conference at Union Station, TARC’s headquarters. Transit, free to download, has been a popular mobile app with TARC passengers. TARC first made WiFi available in 2013 on 21 eTran commuter coaches that cross the river and travel on some express routes, and added WiFi to more buses as funding allowed. Recent contract options with Verizon resulted in significant savings for onboard Wi-Fi, reducing the cost for unlimited data to a fixed amount of about $40 a month per bus. TARC also receives an annual contribution covering WiFi on 55 buses from Lamar, TARC’s bus advertising partner. “The WiFi has been popular from the start based on data use,” Barker said, and a growing number of passengers have mobile phones with internet access. A survey last year of TARC local and express route passengers showed 80 percent of passengers have mobile devices with internet access, 20 percent more than three years ago. “With buses as WiFi hot spots, passengers can now check schedules and bus arrival times, check email, do some work or homework while on the go using TARC WiFi,” Barker said. To connect to TARC WiFi on buses, passengers using mobile devices need to make sure WiFi is turned on, and to tap “RideTARC” as their WiFi option. 3. The Transit App, which has been endorsed by transit agencies in over a dozen cities including Boston and Dayton, integrates real-time transit information for more than 400 public transportation systems around the world. In the past 18 months, the app has been downloaded in Louisville more than 18,000 times, Sion said. More than 1,500 riders are using the app on an average weekday, analytics show, he said. “Relative to TARC’s ridership, our usage in Louisville is among the highest across the US, and without any heavy promotion to date. TARC riders have really embraced our app,” he said. TARC real-time bus information has been available on Transit since 2015 when TARC made its real-time data feed available to app developers. When opening the app, it automatically shows you nearby bus lines and departure times in big text and bright colors. Users can track TARC buses on a map, plan trips from start to finish, set alarms reminding them when to leave home to catch the next bus, and have an alert sound when their stop is approaching. Transit also integrates Uber and starting next month, when Louisville Metro launches its bike share program, LouVelo, the app will allow users to locate bike share stations and buy bike share passes. Passengers, including Mary Lou Ferrell who rides TARC to and from the Highlands and the University of Louisville’s Belknap campus, have praised the app. “It makes riding TARC so much better,” she wrote on Facebook. More details from TARC here.